Scary Terry's World: The Secret Origins of Wild Dog! 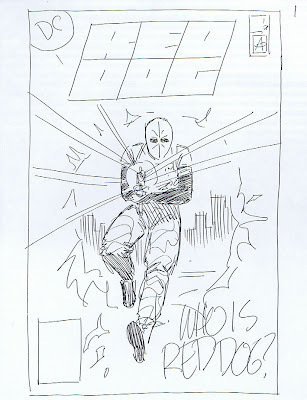 Shown above is Ed Hannigan's rough design for the cover of the first issue of the Wild Dog mini-series. You didn't know he designed that, did you? 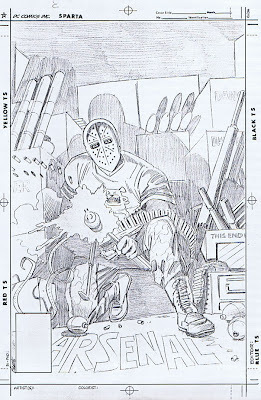 Ed did a lot of uncredited design work for DC over the years -- and all four of the Wild Dog mini-series covers are from his designs. A very (extremely!) belated "thank you" to Ed! 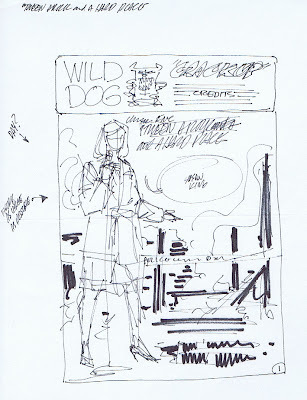 Max Allan Collins and I created Wild Dog for DC Comics some twenty-two years ago. We produced a four-issue mini-series, a one-shot special, and several serialized stories in the ill-fated Action Comics Weekly. That was it. Wild Dog had a short and sweet life. Hugely popular in the Quad Cities area where the series was set, it never quite caught on big enough with the rest of the country to continue. Still, DC maintains ownership of the feature, squeezing WD into some company-wide crossover every few years -- for just a panel or two. Several years after the initial run, Max and I pitched a revival to DC -- specifically to (much missed) editor Archie Goodwin. We had some good talks and I did a few drawings - but eventually we decided DC wanted so many changes to the core concept that it wasn't working for us anymore, and we went on to other things. We never did work on anything for Archie, darn it. But despite his short time on the shelf, Wild Dog still has a (pardon me for saying it) rabid following. 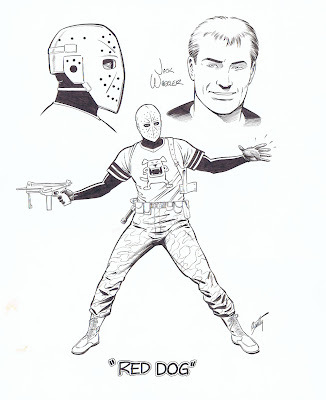 When I (very) recently dipped into my "keeper" art files to sell some original comic art I'd held onto for years, it was the Wild Dog art, more than anything that caused a stir. So, spurred by that interest, I started digging through my files for anything else Wild Dog related. I found the material posted here -- most of which I'd forgotten I had. 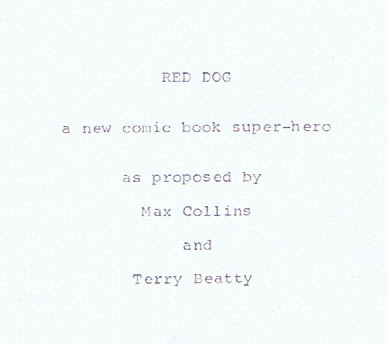 After rejecting "Mad Dog," we settled on "Red Dog" as the character's name and proceded to put together a package to sell the series to DC. 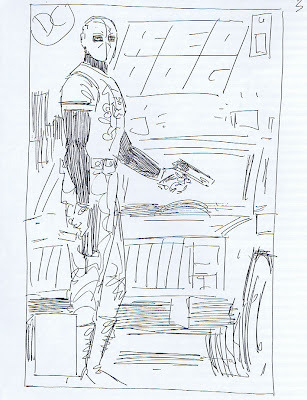 A detail of the cover page for the 16 page series pitch written by Max Allan Collins. The pitch ends with a suggestion that Max write the feature and I ink it over pencils by some classic silver age artist. Thankfully, we all decided I should pencil the thing! 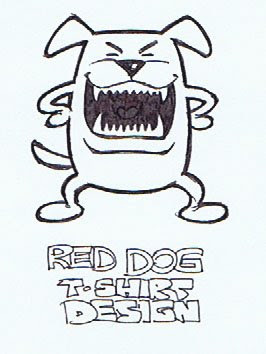 The first drawings of the cartoon dog mascot for Red Dog/Wild Dog's shirt. Here's the evolution of the "pitch art" used to sell the series. He's still "Red Dog" here. 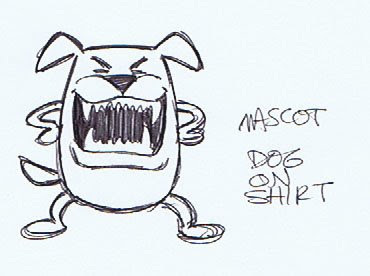 I left the shirt blank on the second piece and made a stack of photocopies of it, on which I drew different versions of what would become the dog mascot design. Logo concepts provided by DC. I'm sorry to admit I've forgotten which talented letterer designed these. 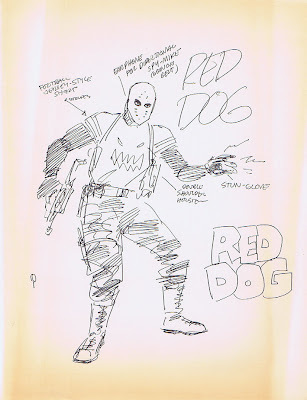 Rough concept sketches for covers -- done when the feature was still being called Red Dog. 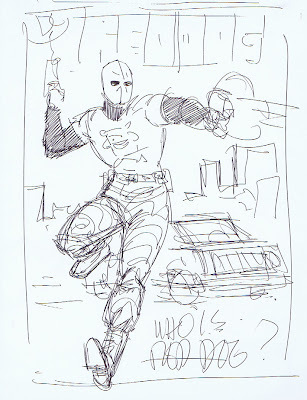 The first of these ended up being drawn -- but rejected by DC. Eventually it was used as an Amazing Heroes cover. 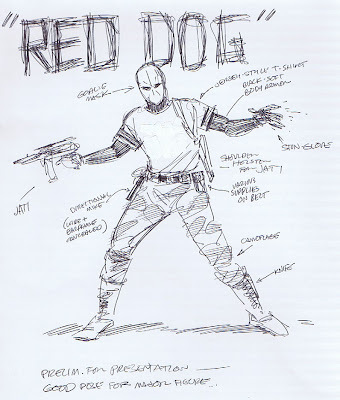 "Red Dog" became "Wild Dog" after discovering a GI Joe action figure had already used the Red Dog name. If we ever wanted action figures of the character, we'd need a name that hadn't already been used. Never did get those action figures, darn it. 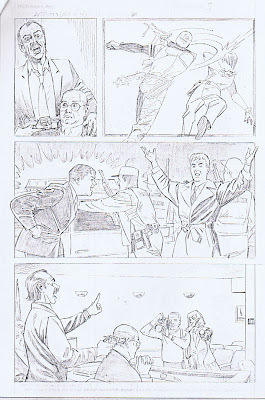 Preliminary roughs for a few Action Comics Weekly pages and photocopies of pencils for an ACW page and two of the mini-series covers are shown below. I hope you enjoyed seeing some of this long-hidden material. 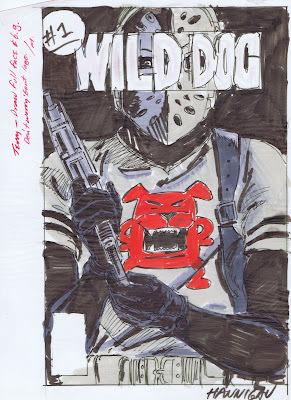 Who knows if Wild Dog will ever return -- but I'm grateful that after all these years, his fans still remember the series fondly. Stay wild, kids! As one of the Wild Dog faithful, Terry, I really enjoyed this "behind-the-scenes" look at the Wild One's creation. I also have to agree with you about the work of Ed Hannigan. I know his cover art was a mainstay in Marvel and DC in the late 70's and early 80's, but has never really gotten the recognition it deserves. Thanks for all this cool imagry and info. Just makes the character all the more cool. Here I am, reading about Ed Hannigan designing the covers, thinking to myself, "I didn't know he did that on this series," and then you mention that we probably didn't know that. How funny. Ed Hannigan is one of those guys in the biz that deserves way more credit than he probably gets. In addition to his excellent cover design work, he drew some great lookin' comics (Defenders #58-60 immediately come to mind), wrote some compelling stories (see later issues of Defenders) and drew a great run on Peter Parker, Spectacular Spider-Man, co-creating Cloak & Dagger with Bill Mantlo in the process. Don't know what he's up to these days, but I've got to say "Thanks, Ed...wherever you are!" 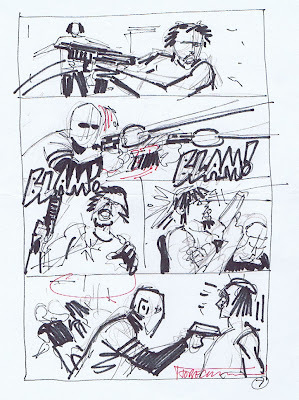 BTW, Terry, thanks for sharing these behind-the-scenes drawings of WD. I've still got an autographed WD poster that you drew for your Time Travelers signing (one of the comic shops referenced in WD, for those curious). Still looks top-notch! 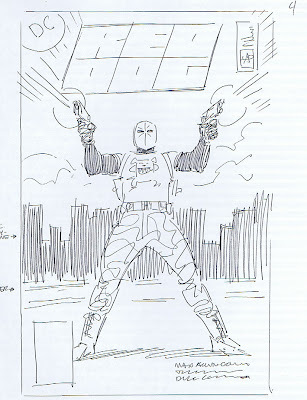 Terry, all of this information and behind the scenes is great...you have all the stuff for a nice big coffee table book on Wild Dog! Just imagine it, I see a nice black cover with the Dog mascot on the cover...a big onmibus edition with all the prelims, etc. And why not throw in a hockey mask for the kids to wear!! All those years in comic class and you just now bust these out!? Those are sweet! your (old, I know) layouts are amazing! it would be really cool to see you do something more like that loose, sketchy look sometime. did Todd Klein design the logo? Hey Terry, thanks for posting this, and thanks for your work creating Wild Dog. The miniseries had a big impact on me and my best friend when we were young... we absolutely loved the character! 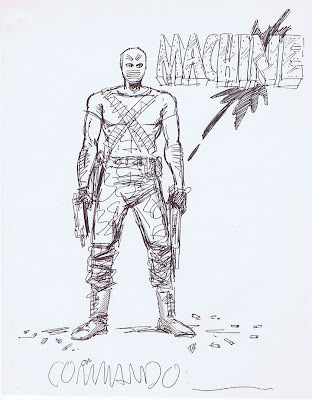 We didn't really collect superhero comics at the time, and Wild Dog was our first exposure to a more violent no-nonsense anti-hero of this type. I even made a custom action figure of him out of GI Joes, and he got played with a lot. (Like you, we had always wished for an official action figure.) Actually, I discovered your blog while looking for pictures of Wild Dog for a new custom figure I am planning to make - this time I want it to be as accurate as possible to the real deal. I loved discovering all the early concepts and information here, so thanks again! 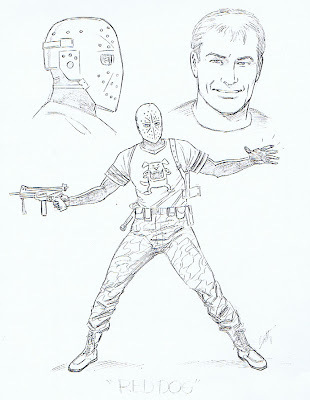 Even if e have seen the last of Wild Dog, he was a great character and is fondly remembered among some of us. 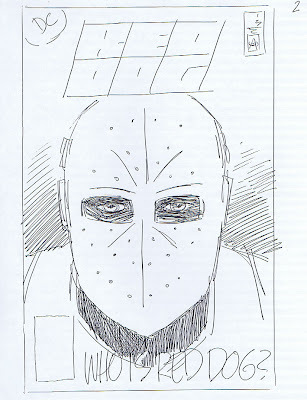 Somebody actually published a series about a vigilante in a hockey mask in the 1970's. This came out long before The Road Warrior in 1981 and long before Wild Dog. This is the first I've heard of the Hitman series -- Max may have been aware of it, but I don't really know one way or the other. 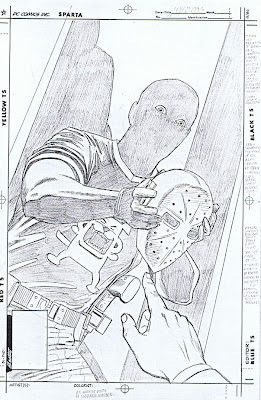 The hockey mask in Wild Dog was meant to invoke the Friday the 13th movies -- as well as be practical/logical face protection within the context of the story. 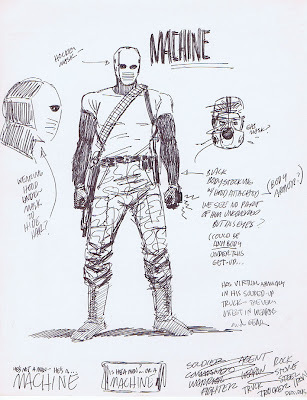 As you can see from the concept sketches, we considered a gas mask, too -- but Golden Age Sandman had already been there and done that.